When a number of individuals combine their association for the purpose to act cooperatively and in mutual accord to meet a certain purpose, then it is known as a society. Basically, societies are usually registered for activities such as sports, culture, religion, art, education, charitable activities, advancement and encouragement of certain activities. However, there are certain set of rules and procedures in place that are to be followed for the establishment and registration of a society. The procedures are laid down by the Society Registration Act in India. The act has been accepted by several state governments without or with further amendments. The act has been set up for the advancement of fine arts, literature, science, distribution of awareness for the good purpose and so that by registering it, it will have better credentials and will be helpful in the implementing the ideas for the development of arts, literature, charitable activities and other things. -The general awareness, instruction as well as promotion of useful knowledge. For the new society registration, specific steps and procedure have to be followed to ensure a successful registration. There is a minimum requirement of at least 7 members to form a society. Companies, other registered companies can even register for the memorandum of society. Society registration is maintained by the state government, and hence the application should be sent to the specific authority of the state. 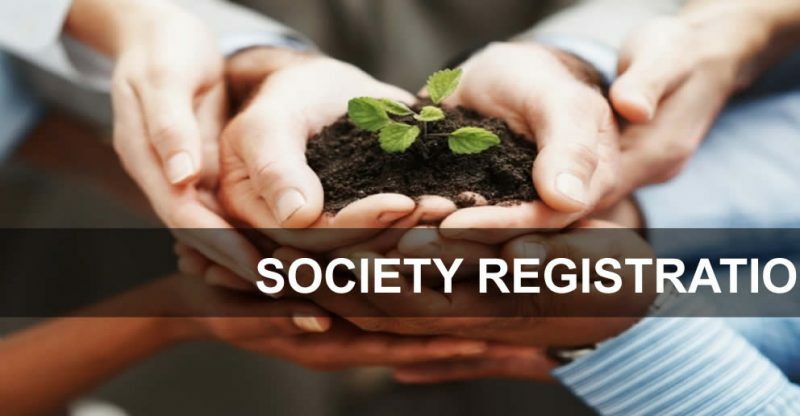 For the registration of the society, the members must mutually decide and agree on the name of the society, and then memorandum must be prepared along with rules and regulations of the society. The decided name should not cause any infringement issue like a similar or identical name with an already registered society. The Memorandum of society along with Rules and Regulations of society must be signed by the mandatory persons. It must also contain specific details of the members of the society. The documents have to be prepared, submitted and then signed for the registration purpose. There are certain documents required for the society registration such as PAN Card, Residence Proof, List of all members, Articles of Association, Memorandum of Association, covering letter, address proof of the registered office of society and then a self-declaration. All these mentioned documents have to be submitted to the Registrar of Societies, with the fees in 2 copies. Once the proper verification is done of the documents, then the registrar will allot a registration number on an Incorporation certificate. Memorandum and the signed rules and regulations have to be filed to the concerned society or registrar of state. Once the registrar is completely satisfied with the application, then it will be certified that the society is registered.